Despite constraints including an uncertain policy environment and a stagnant biofuels market — not to mention the challenges of pursuing groundbreaking technologies for expanding the world’s resources for transportation fuel — investments and advancements continue across the cellulosic industry. The distinguishing factor of cellulosic biofuels is that they are produced from feedstocks such as corn stover, grasses, leaves and wood chips. The bipartisan Consumer and Fuel Retailer Choice Act (S. 517) could provide the vehicle for the market growth for this technology to be replicated across the country. Artificial regulatory barriers, such as the Reid Vapor Pressure (RVP), limit consumer choices and inhibit the acceleration of new technologies. Currently, the most direct route to create additional market demand is by increasing sales of higher blends such as E15, a biofuel that contains 15 percent ethanol. E15 sales are limited during the summer months due to the drafting of a decades-old statute in the Clean Air Act. The Consumer and Fuel Retailer Choice Act makes a technical correction to the statute by extending the RVP waiver to E15. The Consumer and Fuel Retailer Choice Act is pivotal to providing consumers the choice of an affordable, cleaner option at the pump, industry experts say. “The Reid Vapor Pressure limits on E15 stifle market competition and undermine our efforts to bring lower carbon fuels to drivers everywhere,” said Jeff Pinkerman, chairman of POET-DSM’s board of directors. 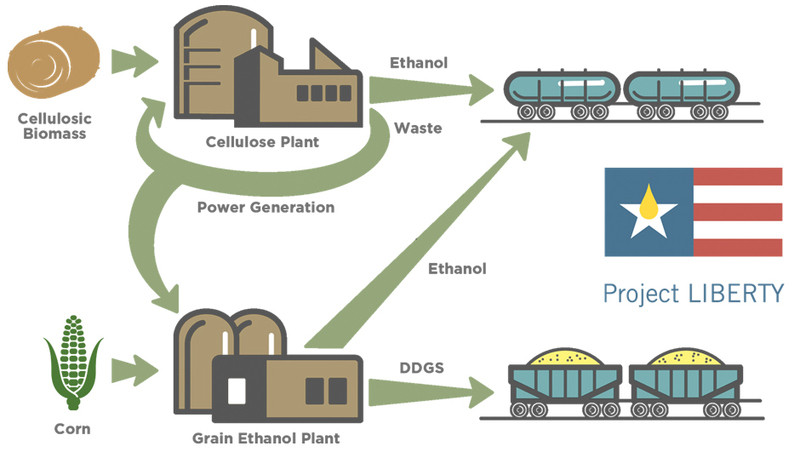 At Project LIBERTY, POET-DSM’s Advanced Biofuels commercial-scale cellulosic ethanol facility in Emmetsburg, Iowa, the plant is seeing new efficiencies. Project LIBERTY is a joint venture between POET and the Dutch biotechnology and life sciences company DSM. “We’re going to make LIBERTY successful, and there’s more optimization improvement needed, but we need consumer access to justify the research and the capital to continue to improve it and get it to where it can be,” said Rod Pierson, Senior Vice President & General Manager, POET Design & Construction. “I always tell people, our plan was never to build one cellulose plant. Our plan was to build dozens. But in order to build dozens, you have to have increased consumer access,” said Dave Bushong, Senior Vice President of Research, POET. “To build more plants and have that increase of jobs and commerce and investments and infrastructure, we just need to have more consumer pull-through of ethanol in the fuel supply,” Pierson said. POET-DSM’s researchers and engineers continue to make efficiency gains based on new research — such as with enzyme and yeast improvements — and by building upon the knowledge they’ve gained through work at POET’s starch plants in processes like bacteria contamination and in operational efficiencies that will help lower capital costs at future cellulose plants. Those enzyme and yeast improvements make the plant more efficient, by lowering storage tank capacity needs, allowing use of simpler processing equipment and improving the conversion of biomass to ethanol. Furthermore, design improvements to the plant’s pre-treatment process — a critical part that sets up the rest of the conversion of biomass to ethanol — have made the process more consistent and reliable. The facility has achieved a rate of 70 gallons per ton of biomass, which is near the target conversion rate. The work being done at Project LIBERTY is laying the groundwork to expand the cellulosic industry. For example, the colocation of Project LIBERTY and POET Biorefining – Emmetsburg — a 55-million gallon per year starch plant situated alongside it — is a model that allows for operational and cost efficiencies, both of which are key to making the industry work. Seeking out development routes and clearing the path for cellulosic biofuels is pivotal for the U.S. economy and beyond, noted Jonathan Male, Director for the Bioenergy Technologies Office in the Office of Energy Efficiency and Renewable Energy for the U.S. Department of Energy. The potential that cellulosic biofuels offer for the environment and economy is staggering. The “2016 Billion-Ton Report,” released by the U.S. Department of Energy and Oak Ridge National Laboratory, indicates that the U.S. has the potential to produce at least one billion dry tons of biomass annually that can be used to produce bioenergy without adversely affecting the environment. This analysis showed that this amount of biomass could be used to produce enough biofuel, biopower and bioproducts to displace approximately 30 percent of U.S. petroleum consumption. The Project LIBERTY team has put in many long hours working through challenges that come with converting feedstock into renewable biofuel. It has been a learning process, team members say. But these gains will allow POET-DSM to make even further improvements at future cellulose plant locations, Pierson noted. One major advantage of POET having 27 starch plants is that it has provided the company with the industry knowledge to make improvements at LIBERTY. “There have been times where we run into issues at LIBERTY where we had similar issues at the starch industry in the past. We took advantage of that knowledge of the starch process to get us to a solution on the cellulosic side faster,” Pierson said. For example, the team has used their experience of dealing with bacteria contamination in the starch industry to make changes to reduce the contamination at LIBERTY. Bacteria contamination is a concern in the fermentation stage, where bacteria thrive and compete against the yeast to consume the sugars, resulting in yield loss. “You don’t want the bacteria to eat the sugar; that’s yield loss. The yeast can’t compete against bacteria very effectively. We take all these precautions to keep the bacteria from growing. All of those transfer from the starch business to the cellulosic business,” Bushong said. Changing the method of running pretreatment is the largest design improvement that’s taken place at LIBERTY thus far. The plant material must be pre-treated to allow enzymes to break down the biomass. If the pre-treatment process doesn’t work, it prevents the rest of the plant from running. “Since making those adjustments, it’s been steady improvements with more continuous operation, higher rates of production,” Pierson said. POET-DSM has also gained operational efficiencies at LIBERTY based on what was already established at POET’s 27 starch plants. That model of plant operations was implemented at LIBERTY, from maintenance to training operators and implementing safety protocols. From a plant management perspective, plant maintenance and safety has been the same as at the other locations. “If you look at the foundation of plant operations expertise that POET has, all of that leverages seamlessly into LIBERTY,” Bushong said. Project LIBERTY was also designed to have synergies with POET Biorefining – Emmetsburg. The two plants share a customer base for the corn and biomass procurement; have shared infrastructure, including roads and ethanol storage; and have common plant management oversight. Project LIBERTY also sends power to POET Biorefining – Emmetsburg. At LIBERTY, steam is created from the residual lignin that doesn’t become ethanol. The excess steam goes to power the starch plant. Also, through anaerobic digestion, Project LIBERTY creates a biogas — methane — that will replace natural gas in the starch plant. Because of these power synergies, it also improves the environmental footprint of the starch plant. “We are using green energy to produce green energy,” Bushong said. The plant also provides another much-needed revenue source for area farmers like Bruce Nelson. Nelson farms with his dad and uncle three miles north of Emmetsburg. He sells most of their corn to the ethanol plant, and all three are involved in providing stover to LIBERTY. From providing another revenue stream for the agricultural economy to providing a renewable, low-carbon fuel, increased cellulosic production has wide-reaching implications. That’s why working to remove policy barriers like limits on year-round E15 sales is so pivotal, Pinkerman said.